I recently wrote a review of the very elegant activity tracker Misfit Shine. 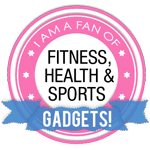 This time I will cover the sporty Misfit Flash Fitness and Sleep Monitor which is another fitness tracker from the same manufacturer. You can either use the Flash inserted into a wristband or a clip you can attach anywhere on your body. You are supposed to carry the tracking device around 24 hours a day and because it is waterproof down to 30 m swimming or diving is no excuse to take it off. The device tracks all the necessary things like calories burned, steps, distance and how well you have slept in the night. All the data is transferred to your smart phone or tablet through Bluetooth LE which is a low energy synchronization method. Therefore the device needs to be very close to your smart device, preferably the screen. In the free basic App you can compete with friends if they have the same kind of equipment and set your goals. If you have the app MyFitnessPal it works with that one too. Most modern smart devices are compatible with the Flash. The fitness trackers from Misfit have a design that make them stand out like cool modern wristbands and they doesn’t look like traditional bulky activity trackers. At first glance the Flash and the Shine looks a bit similar so I will find out what’s the real difference between the two. The first thing to notice is that the price is a bit cheaper on the Flash, almost twice as cheap as the Shine in some stores. This price reduction must count for something and surly the Flash doesn’t feel quite as luxurious as its older brother. The Misfit Flash activity tracker is made out of plastic which makes it a bit lighter than the Shine which is made from aluminium. 12 LED lights are placed in a circle around the face of the Flash device. They show you how active you’ve been that day and if you reached your goals. Unlike the Shine where you had to tap the surface to interact, the face of the Flash is a button you press to make things happen. The time is also shown with the LED lights when you push the button. First the LEDs at 12, 3, 6 and 9 o’clock shows up dim then the hour light up a bit brighter and then the minute. A very stylish way to tell the time and it works like a charm. The battery is a CR 2032 coin cell type that lasts for up to 6 months before replacing. It is good in that aspect that you don’t need to recharge the device very often. If you want a cheap fitness activity tracker for entry level this one is perfect. There is really nothing in particular that is very bad with this product and the price itself justify the purchase. Where Can I buy Misfit Flash? If you want more info before buying, check out the Misfit Flash reviews from other users here. Do you have any questions or comments on my Misfit Flash review, do not hesitate to send me an e-mail on andreas@newfitnessgadgets.com or leave me a comment below. Wow. I am definitely going to buy myself one of those activity trackers. It’s a great product for sure! Pretty sure you will be happy with this activity tracker. 🙂 Good luck. I didn’t realize there were so many gadgets out there like this, nice review, thanks for all the info!